The light is compatible with all of Cateye's assorted mounting options, but only comes with the flex-lock mount, which is a narrow band of plastic which can be wrapped around a seatpost and then tightened with a plastic nut. The mount seemed reasonably sturdy, although I would have preferred a more traditional seatpost mount. The Rapid 3 is powered by a single easy-access AA battery, which is probably why it had such poor battery performance. The light only lasted about 20 hours on rapid mode before becoming too dim to be useful. It isn't the best performance for your money, but is a bright and easy to use light. The low-power option is a nice perk for people who often ride in groups and want to be seen without blinding their followers. 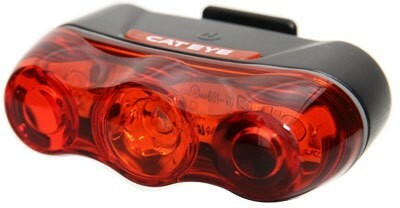 The Rapid 3 is one of Cateye's newer lights. It has a center high-power LED (probably 1 watt, but unspecified), and one low-power 5mm LED on each side. This was one of the brightest lights tested. It includes a solid mode which only turns on the center LED, a "rapid" mode which flashes all three, and a low-power mode which only flashes the 5mm LEDs. This mode is not as bright, but saves power and is good when biking with a group or on a multi-use trail where you would want to avoid blinding fellow cyclists.